We've arrived safe and sound and with luggage in hand in Cochabamba, Bolivia — the City of Eternal Spring. And that's no marketing slogan ... it's early autumn here but all the trees are in flower. The climate couldn't be more perfect! After my husband wakes up from his post-jetlag nap, we'll go exploring. I'd like to share with you some thoughts that my friend Elise just sent. Elise is the moderator of the listserve of Environmental Education Ontario (EEON). She'd sent round information about the upcoming World People's Conference on Climate Change and the Rights of Mother Earth (the reason we're here in Bolivia), noting that there's no Working Group on education. I responded that my one hope, while I'm here, is to help all Working Groups see that a massive education campaign is going to have to be part of any solutions or strategies they adopt. Hola Julie!! I'm so glad you're there. I would love it if you could somehow get across a proposal that we all need to demand of our education systems that they introduce policy for sustainability and climate change mitigation!! All countries have education systems. Wherever possible, as many kids as possible go to school. School is a common-culture-building tool. It gives us mental constructs in common — written language, math, someone's version of history, a political and "resourcist" view of geography. And analytical science/tech. So now that this kind of "get-ahead" education has contributed to making us want to always get more ... how could it teach us that we have to learn to be sustainable? And stop belching fossil fuels? As a parent, Elise spent 10 years pushing a large Canadian school board (successfully!) to adopt policy on environmental and sustainability education. She then spent 10 years pushing the whole province of Ontario, Canada to similar policy (again, successfully!). She believes that public opinion does matter when directed at educational policy makers. Most people do not make any demands of any kind on school systems for environmental content. They tend to stick to projects, which they can manage themselves. This suits policy makers very nicely. We need to look up at these bastions of decision-making and demand that they cooperate. I agree. Indeed, most parents feel quite small or helpless when faced with large education organizations. But those are our children they're educating! And our children's future they are — literally — creating. We have every right to speak up! Elise also noted that in 1992, at the Rio Earth Summit, the UN's Agenda 21 included a whole chapter on "Education for Sustainable Development" (Chapter 36). 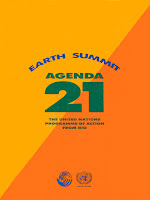 She suggested that the World People's Conference link back to Rio and Agenda 21 as they push for a UN Declaration. "It's a perfect tie-in," she said. So, if there's anything related to education and climate change / the rights of Mother Earth that you would like me to take to this conference, please don't hesitate to click on that little Comments button! p.s. You can register and participate online! Indeed, if you don't attend the conference, you can participate in four working groups! Visit http://190.181.28.33/indexe.php to register first (for free), and then use your registration number to sign up for working groups.